New York State Attorney General Eric T. Schneiderman on Tuesday announced an investigation into the business practices of leading daily fantasy sports (DFS) sites DraftKings and FanDuel following recent revelations that prominent company insiders appear to have been using restricted information as a strategic aid while competing as users on each others’ sites, and perhaps on other DFS sites as well. Twin letters demanding information were sent to the CEOs of the two DFS companies, Jason Robins of DraftKings and Nigel Eccles of FanDuel. FanDuel itself is based in New York, while DraftKings is in nearby Massachusetts. The two companies together stand well above all other DFS providers in terms of market share. The erupting scandal centers on the activities of DraftKings written content manager Ethan Haskell, who won $350,000 by finishing second in a major FanDuel contest based on Week 3 NFL player performances. However, a short period before that Sunday’s slate of games went live, Haskell himself accidentally leaked a chart showing players-drafted percentages, raising the question of how soon he had been in possession of that data for that or other contests. Haskell was subsequently shown to have put together an amazing string of successful DFS entries spanning the past several months in both MLB- and NFL-based contests, raising widespread allegations that he had used the players-drafted-percentages info from DraftKings’ contests to build optimal lineups in similarly constructed tournaments at FanDuel. Meanwhile, a similarly uncomfortable spotlight has found a comparable FanDuel employee, Matthew Boccio, who has put up a similar run of successful DFS outings while competing over at DraftKings. Neither company allows employees to bet in their own contests, but until yesterday, when such a rule was hastily enacted, DFS employees were freely and frequently competing on other DFS sites. Use confidential player information to gain an advantage playing against players on a different siteShare confidential player information (such as win rate) to anyone outside of the company. Such rules, however, are voluntary and carry no enforcement penalty if violated. 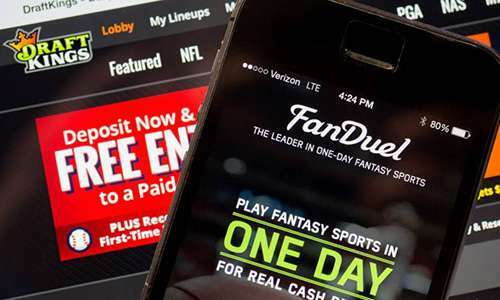 Despite recent statements made by DraftKings and FanDuel executives to the contrary, it appears that no serious attempts to dissuade play on competitors’ DFS sites have been made by the market leader. In DraftKings’ case in particular, according to some of the allegations that have been launched, such play may even have been part of the company’s culture — a not wholly unbelievable claim when considering the company’s well known online-poker roots. In any event, these market leaders’ apparent lack of foresight and market responsibility now has politicians and legal officials lining up to do that enforcement for them. New York AG Schneiderman’s twin letters (combined, below) represent the first of what is likely to be several concurrent investigative pushes into the operations of the two companies and the DFS world at large. This letter follows reports indicating that employees or agents of [Company Name] may have gained an unfair, financial advantage in a contest known as “Daily Fantasy Football” by exploiting their access to nonpublic data. These allegations, and your company’s subsequent statement, raise legal questions relating to the fairness, transparency, and security of [Company] and the reliability of representations your company has made to customers. f. Compile and aggregate daily fantasy players’ data, including but not limited to win/loss records, types of contests entered, number of entries per contest, and money spent and earned. 2. Where is the above data stored? 3. Do you limit access to this data, or any part thereof? Please describe any and all measures or policies in place to ensure that unauthorized parties cannot gain access to such data, including but not limited to an internal fraud control system. d. Any formal policies or procedures concerning employee participation in fantasy sports. 5. Please explain [Company’s] policies or practices prohibiting or restricting employees, their friends, and/or their relatives from utilizing information collected by [Company] for any non-company purpose. 6. Please explain [Company’s] policies or practices prohibiting or restricting employees, their friends, and/or their relatives, from playing daily fantasy sports on [Company’s site] or rival platforms. 7. Please explain any [Company] policies limiting the winnings that can be claimed by employees, their friends, and/or their relatives, from playing daily fantasy sports on [Company’s site] or rival platforms. 8. Please describe in detail the incident surrounding the use of information by Ethan Haskell, as detailed in Daily Fantasy Sports Report. Additionally, please describe any and all actions by DraftKings to respond to the incident, including any changes to company policies or practices. 9. Please describe in detail when DraftKings learned that any employee, including but not limited to Ethan Haskell, may have used data from DraftKings to gain a personal advantage in playing daily fantasy sports. Please identify any and all such employees, their job titles, and their job descriptions. 8. Please describe in detail the incidents surrounding the use of information by Ethan Haskell and Matthew Boccio, as detailed in Daily Fantasy Sports Report. Additionally, please describe any and all actions by FanDuel to respond to the incidents, including any changes to company policies or practices. This is a limited, initial inquiry designed to allow your company to provide a reply quickly. Please respond as soon as possible but, in any event, no later than October 15, 2015. FanDuel, early today, announced that the temprorary ban on its employees playing on other sites, hastily erected yesterday, had been made permanent as of today. DraftKings has been a bit slower to respond, though it has had to deal with an advertising shakeup, as it “voluntarily” agreed to pull the company’s name and brand from favored-placement positions in various forms of ESPN broadcasts and content. Both FanDuel and DraftKings are still allowed to run standard ads on ESPN for time being, and ESPN itself is a return sponsor with a significant investment in DraftKings. Other US officials have also joined the investigative party, including two familiar to the online-poker world, California State Rep. Adam Gray and US Senate Majority Leader Harry Reid. Both have called for various forms of investigation into the legality and business practices of the new DFS industry, which itself was made possible by a specific carveout included in the US’s 2006, federal-level UIGEA.